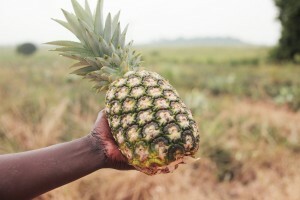 There are four types of pineapples grown on Jei River Farms. The MD II is our most popular among exports with Smooth Cayenne, Sugar Loaf and Queen Victoria completing the stock. 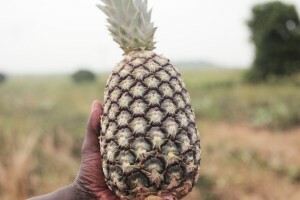 We are well known with our clients for having the best quality pineapples in Ghana with great shelf life. 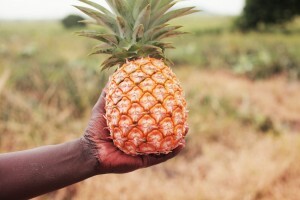 There are different characteristics of to each pineapple which means they appeal to different clients. The MD II variety makes up 85 percent of stock on the farms. It is the most popular pineapple in European customers because of its aroma and sweet taste. The key to the success of the MD II variety with supermarkets is it’s a long shelf life, hence it can be found in many grocery stores in Western Europe. The Smooth Cayenne once stood where the MD II is to our European customers. Now, it is the favorite of food processors who like its relatively high acidity and fiber content. The Cayenne currently comprises 10 percent of production. The sugar loaf has a niche market in Europe. It is liked for its high sugar content. Locally, a lot of our customers like its taste. 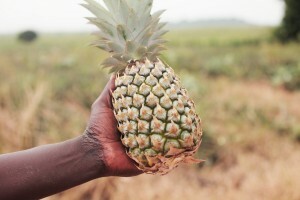 It is also popular among processors who use it for a blend with other pineapples for sweet tasting juices. The dried fruit industry swears by the Queen Victoria. It has a long shelf life and does not stick when dried. This variety is originally South African but was first multiplied in Ghana at Jei River Farms. It makes up for one percent of the stock.